Russian and Iranian forces have warned US President, Donald Trump that they would retaliate with military action if he launched more airstrikes against Bashir al-Assad in Syria again. This comes after the airstrikes against Syria on Friday in retaliation to the chemical attacks by Assad on his own people. 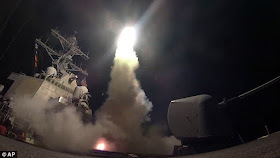 In an ominous threat, they said the US President had crossed a 'red line' with his surprise missile bombardment on Bashar al-Assad's forces. 'From now on we will respond with force to any breach of red lines and America knows our ability to respond well,' the military chiefs said in a joint statement with militant group Hezbollah. The Russian Embassy in London suggested on Sunday night there could be 'real war' if Moscow is presented with an ultimatum over Syria. 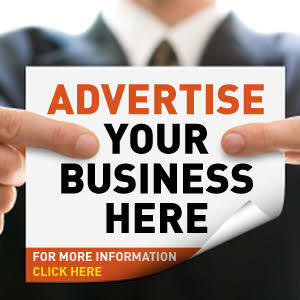 But UK Foreign Secretary Boris Johnson has said he intends to lead a push on Monday for Russia to face tough new sanctions unless it withdraws its support for Assad. Officials in the Trump administration on Sunday demanded Russia stop supporting the Syrian government or face a further deterioration in its relations with the United States. US Secretary of State Rex Tillerson will visit Moscow later this week for scheduled talks with Russia. US officials said Russia, in propping up Syrian President Bashar al-Assad, bears at least partial responsibility for Wednesday’s poison gas attack on villagers in Idlib province. “I hope Russia is thinking carefully about its continued alliance with Bashar al-Assad, because every time one of these horrific attacks occurs, it draws Russia closer into some level of responsibility,” Tillerson said on ABC’s last week. Although officials acknowledged that they have seen no evidence directly linking Russia to the attacks, the top national security adviser, Army Lt. Gen. H.R. McMaster, said Russia should be pressed to answer what it knew ahead of the chemical attack since it has placed warplanes and air defense systems with associated troops in Syria since 2015. “I think what we should do is ask Russia, how could it be, if you have advisers at that airfield, that you didn’t know that the Syrian air force was preparing and executing a mass murder attack with chemical weapons,” McMaster said on Fox News. 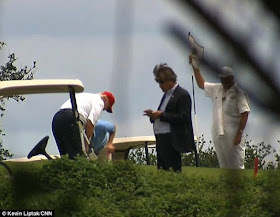 Despite the looming threat of war following the decision to launch airstrikes, Trump made his way on to his golf course in West Palm Beach, Florida on Sunday to relax. 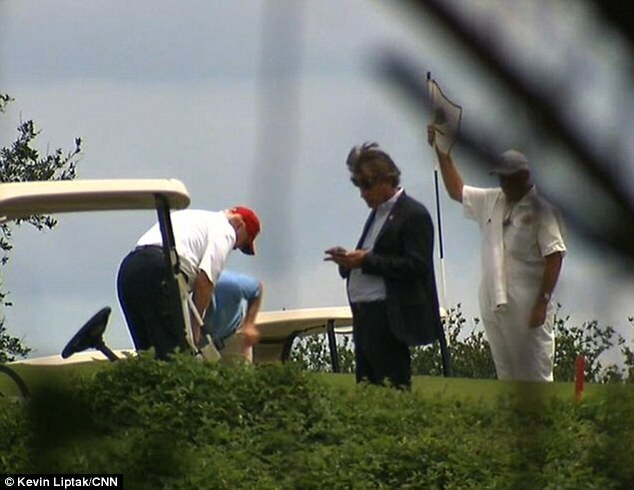 This will be his 16th visit to one of his own courses since he became president on January 20, 2017..